A void in the Great Pyramid of Giza that a team of researchers said they have discovered is not a new discovery, said Zahi Hawass, former antiquities minister. 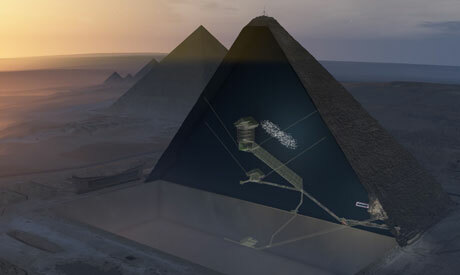 “The void is the first large inner structure discovered within the 4,500-year-old pyramid since the 1800s—a find made possible by recent advances in high-energy particle physics,” according to an article published in the journal Nature on Thursday. The article said the 30-metre void deep within the pyramid is situated above the structure's Grand Gallery, and has a similar cross-section. Its purpose was not clear, researchers from the ScanPyramids project said in the article. The Grand Gallery is a 153-foot-long, 26-foot-tall corridor that leads to the burial chamber of Khufu, the pharaoh for whom the pyramid was built. “However, it remains unclear what lies within the space, what purpose it served, or if it is one or multiple spaces,” said Hawass, who is head of the Ministry of Antiquities’ scientific mission supervising the ScanPyramids project. Hawass told Ahram Online that the claim that the void is a new discovery is not correct. Dieter Arnold, who wrote a book called Building in Egypt: Pharaonic Stone Masonry, mentioned that the construction gaps in the pyramid are present above the entrance to the descending corridor and by implication, the whole passage system, which would include the Grand Gallery. “I do believe that we have to be always very careful about the word ‘void’ because the Great Pyramid is full of voids,” Hawass said. He explained that Egyptologists know how the pyramid was built. The base is a part of a solid rock formation (about 8 metres in height) onto which large stones were placed to form the pyramid's core. The stones, from a nearby quarry, were different in size, with some smaller than others. Hawass said that the internal core structure shows great irregularities, unlike the fine stone masonry of Tura limestone that comprises the outer casing and platform. None of the core stones of Khufu's pyramid are modular in size or shape. Large gaps exist between stones. In addition, Hawass said, the builders may have left larger voids and spaces as intentional construction gaps. A void does not necessarily mean a room, he commented. Many expeditions have used resistance surveys over the past 50 years. These expeditions came from Berkeley, Stanford, Japan, and France, Hawass said. They always show possible voids inside the pyramid, according to Hawass, because they like fame and promotion for their new equipment. This current expedition, at the beginning of their work, made an announcement at a big conference on the east side of the Great Pyramid, and showed that in one area on the east side, there was a stone that was five degrees higher in heat emissions than the rest of the pyramid. “When I examined this area, I found that the stone at the east side was placed there in 1939 to support this area as restoration, and was supported by cement. This is why this area had a higher temperature than other blocks,” said Hawass. “We saw that the team of the ScanPyramids project showed a video in October of last year about their work inside Khufu's Pyramid. The video showed at the end a geometric reconstruction of an unknown passage behind the chevrons above the descending passage. This reconstruction of a passage is pure hypothesis to explain an anomaly. The ScanPyramids project cannot define the shape, size, or exact position of that void. So, we have to be careful on how the results are presented to the public,” Hawass argued. He added that the ScanPyramids formed anomalies or voids but no unknown passages were discovered. “We think that [Antiquities Minister] Khaled El-Enany appointed us as a scientific committee to review this work, because it is important to review the data by a team who spent their lives working inside and around pyramids. “We are not at all against any discovery but we as a scientific committee are responsible for explaining to non-Egyptologists the purpose and method of construction of the Great Pyramid,” he said. “We wrote in our report which we presented to El-Enany that the ScanPyramids project should continue their work but they have to use the scientific approach, and we are happy that this paper is published. We, on the other hand, are going to publish a paper on our opinion on this work, as a scientific committee," Hawass said.